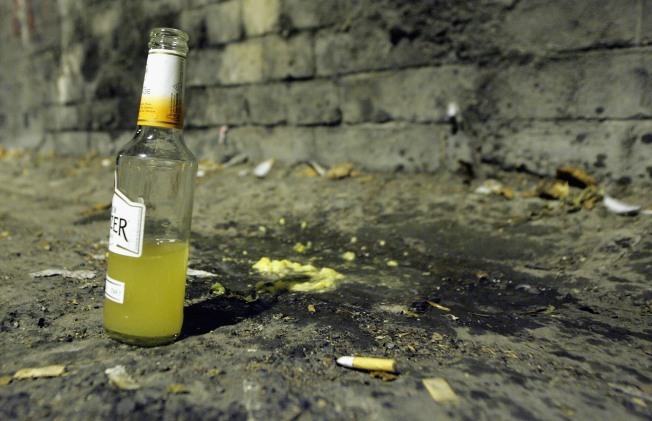 A bottle and vomit left in the street outside of a pub in Bath, England. The perfect cake: a passed-out bottle of tequila. Duff Goldman is not your typical baker. He is famous for making cakes with drill saws and blow torches and staffing his bakery with fellow rock musicians. He is one of the most sought after cake makers in the country who is know for his crazy cakes and design. And his vomit inspired Tequila bottle is no exception. Learn how to make it yourself. We swear this vomit tastes better going down than the average vomit tastes coming out.